A 150 KM drive from Chennai on the scenic East Coast Road leads to the French flavored union territory, Pondicherry or Puducherry. 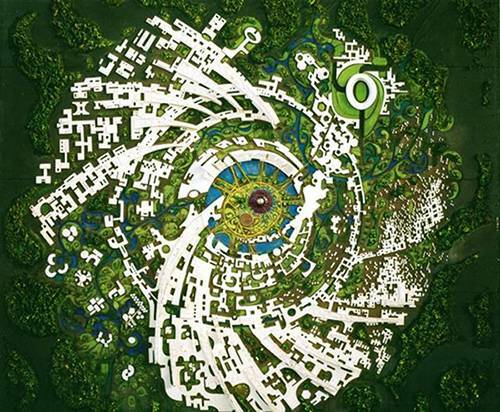 A few kilometers away from this colonial city, is a relatively less known one of its kind township in India; Auroville. What to expect at Auroville? 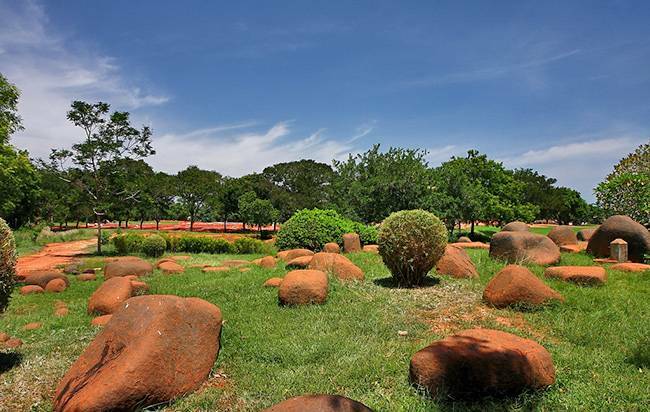 More often than not Auroville is visited by tourists on a day trip from Pondicherry – a visit to the visitor’s center, a bite of Italian pizza, and a look at the Matir Mandir is the itinerary of such lot. One should go to the Visitors’ Centre and get a day pass to see Matir Mandir. Matir Mandir is a fifteen minute walk from Visitors’ Centre but a shuttle also runs every thirty minutes. To be able to visit the Matir Mandir or experience meditations sessions that happen there every morning, one needs to obtain the pass a day before. Visitors can shop Auroville’s unique products manufactured right there at some boutique shops near the Visitors’ Centre. To experience the true Auroville one should live with the community and spend time learning the people’s way of life. For beginners, Auroville is a bit daunting, be prepared to deal with mud roads cutting through dense forests, frighteningly quiet areas most of them with no street lamps, little to no mobile connectivity. It is a perfect place to unwind. A read through their website which is loaded with useful information for visitors is the place to start the journey. You need to reserve your stay through the Auroville website. 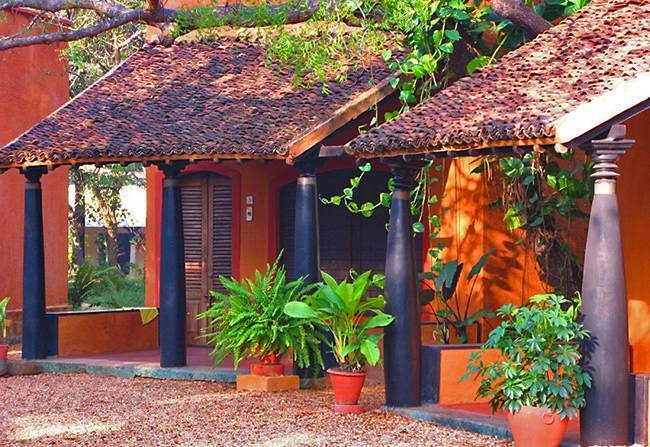 There are multiple stay options available inside Auroville suiting every budget. Where to Stay at Auroville? Auroville has a large number of guest houses and home stays for all range of budgets and needs. But, for utmost experience opt for farm stays which are huts with basic amenities but in place of comfort an open window to nature is offered. For bookings you can contact Auroville’s Guest Accommodation Service. To reach this coastal town driving down from Chennai is the most preferred option. A taxi from Auroville can be hired for pick up from Chennai airport. Also, a number of government and private buses run from Chennai to Pondicherry at frequent intervals with majority of them stopping by this town. The newly opened Pondicherry airport has flight services from Bangalore. If driving down from Bangalore avoid Bangalore – Krishnagiri – Tiruvanamalai – Pondicherry route as road between Krishnagiri and Tiruvanamalai is in very bad condition. Banaglore – Vellore – Tindivanam is the suggested route to take. Visitor’s center café – for a mix of south Indian, and continental food. Besides these there is Farm Fresh for a quick snack, Le Morgan for South Indian and French food, Solutude Farm for organic South Indian meals. Residents have a great option of eating at the Solar Kitchen using Aurocards where meals vary from Rs.150 to 250. *Most restaurants and cafes inside Auroville close early in the evening by 6 PM. This is a town of muddy roads. To go around Auroville the best means of transport is a motorbike or a bicycle both of which can be easily rented. Ride around the town to marvel at aesthetically constructed houses, ravines running around the town, hidden farms, landscapes, community centers, quirky pieces of art and more. Hire a taxi for commuting in and around Auroville in comfort. Bicycles can be rented from inside Auroville for about Rs. 40-50 a day. Motorbike rental varies for Rs. 120 to 500. A bus operated by Auroville shuttles to Pondicherry at regular times during the day. A trip to Pondicherry in shared auto-rickshaw or tuktuk costs around 80 rupees. More than ‘What to see’, Auroville is a ‘What to do’ kind of place. Volunteering is a happening culture around here, which is the reason why volunteers across the world flock to this place all around the year to be a part in building this community. Organic farms, schools, gardens, construction sites, organizations, and small industries accept short and long term volunteers. A few of them offer free stay and food for volunteers in return for their work. Apart from volunteering, workshops for body, mind, and soul conducted by experts with distinct backgrounds is a unique feature of this place A quick browse of the website will reveal the schedule of classes and workshops happening around the town. From meditation, and yoga, to tango, and salsa, this place is for people who don’t shy away from trying new things. A trip to Auroville would be incomplete without a dip in the cool and clean waters of the Bay of Bengal. There are quite a few beaches around here which are relatively less crowded and cleaner. Bodhi beach which is a short 15 min drive from the Auroville town is well-known for regular sighting of surfers. Try the surfing school to get a taste of surfing. Auro beach is another great place to relax altough its little far from Auroville itself. Also Read: Pondicherry’s Top Beaches – 6 Best Beaches of Pondicherry! 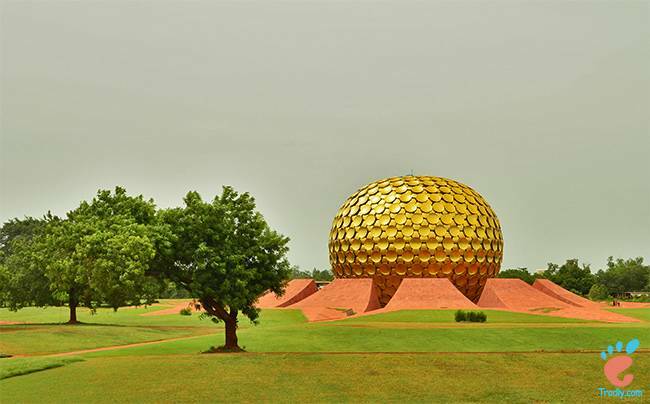 Lastly coming to the main and the hugely popular tourist attraction – around which the whole of this town is constructed – the MatriMandir or Golden Globe, which is the meditation center for the people of Auroville. It is a giant globe made of plated gold which houses a meditation crystal. For outsiders to visit this place, a pass has to be purchased from the visitor’s center. The Visitor’s center is the place where a visitor of Auroville gets acquainted with its history, vision, purpose, construction, and goals. It is a guide building to this universal township. 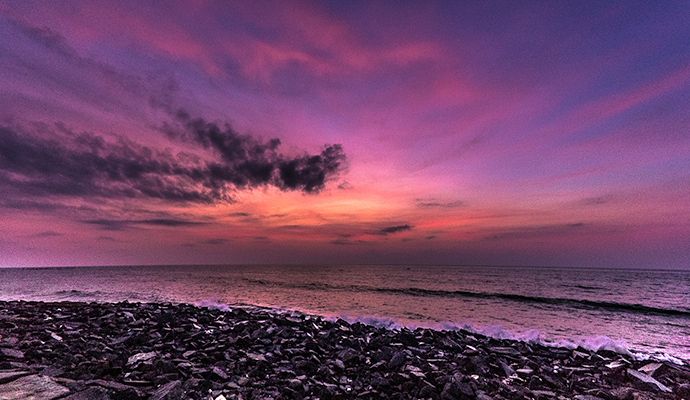 A visit to Pondicherry should definitely be on your agenda if you have come all the way. Pondicherry has a lot to offer in term of French colonial era architecture and great food. Take a walk on Goubert Ave along the beach and have a snack or coffee at Le Cafe, shop at some handicraft stores or just relax on the beach. You can also visit the Pondicherry Museum which brings back memories of the glorious past or have a meal at Le Space, Madame Shanthes or La Maison Rose. If you have time you can take an excursion to Arikamedu, the ancient Roman trading center or Oussudu Lake which are both 15 minutes drive from city center. In a nutshell, this place has something to offer for every type of traveler, getting oriented to this place is what makes the difference.